I have hired Native Journeys for several sports adventures in the last years. I would not be able to decide which one was the best: Snowshoeing, Mountain Biking, Hiking, Skiing… Every one of them was a perfect combination of sport and incredible landscape. Franz is always able to find breathtaking spots on our way, which makes for an unforgettable experience. And… when you start thinking that it could not be better; we get a restaurant or a hut to enjoy local food and/or a nice beer to recover some energy! Nice conversation including explanations about the background of any place is also part of the adventure. According to my experience, there is no better adventure for someone who loves nature and sport….and not to forget good food! In July 2012 our family of four spent a memorable week hiking the stunningly beautiful Austrian Alps, with custom guiding provided by Native Journeys in the quaint city of Bregenz on Lake Constance. Native Journeys is owned by native Austrian Franz Herbert and his native American wife, Sharon – which explains the company name. The four things that impressed us most about Native Journeys were their flexible, informal approach (no European regimentation), intimate knowledge of the environment, outstanding value, and ability to turn a simple holiday into an adventure. All we had to bring were hiking boots, a light day pack and cameras. Everything else was arranged for us, including luggage storage, transport to and from our Bregenz hotel, and reservations in the alpine hikers’ “huts”. On the first morning, Franz collected us from the hotel down the road from his house and stashed our bags in his basement. We then took a train a few km to a cable car that brought us up to mountain-top level. We could have hiked up, but the cable car saved half a day and was itself part of the adventure. Each day we walked a comfortable distance at a comfortable pace, with plenty of breaks to rest or take photographs. Attempting to describe the scenery is pointless. Just Google Austrian Alps and you’ll get an idea, but of course without the third dimension of distance, which is what takes your breath away. Fine weather helped, but one of the most memorable mornings was foggy, which lent a Hobbit-like spookiness to the area. The “huts” we stayed in were luxurious, with reasonably-priced restaurants and bars, broad verandas, stunning views and comfortable sleeping facilities. One day we crossed a high saddle and had lunch in a Swiss hut where prices were about double! It seemed weird to move from one country to another simply by alpine trail. On the return journey, Franz and our fearless son Andrew climbed to the top of a snowy peak while the rest of us made our way back to the hut. Such spontaneous changes of plan are one of the reasons we looked for private guiding, not a group tour. The next day we all topped one of the highest peaks without equipment. Though much fitter than us, Franz picked a route we all could mana ge, but was still pretty challenging. At one point we traversed a narrow ledge with a chain secured to the rock face and a beetling drop to our left. Getting to the top felt like quite the accomplishment, with high-fives and selfies all round. Descending on the last day was an adventure in itself, going from snowline through picturesque alpine meadows (complete with cow bells and their owners), to the top of a lower cableway. Franz and the kids took a wheeled bob-sled ride while the wife and I floated down by cable car. Watching them whoosh by beneath us was a perfect end to a perfect trip. I’m sure there are other good private guiding companies in Austria, but next time we’re going straight back to Native Journeys. 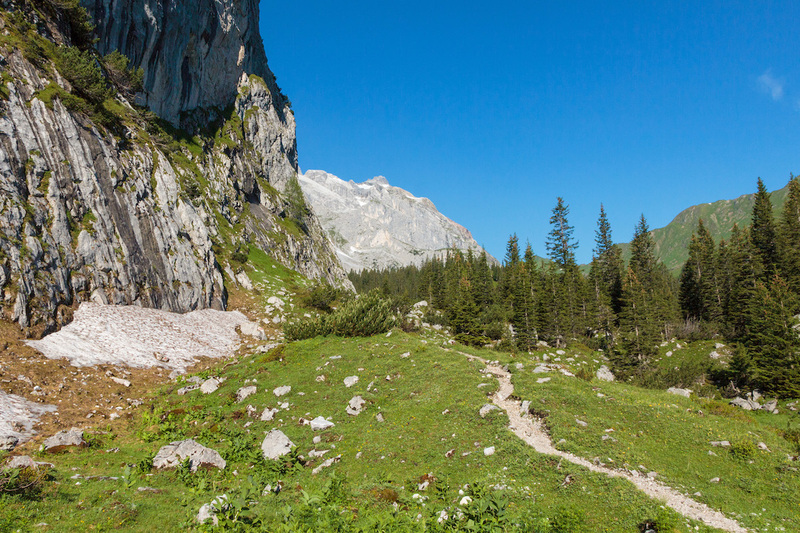 Hiking in the Austrian Alps is a breath taking experience, in every way. It can be as casual or as strenuous as you care to undertake, but it is spectacular regardless. You can access the Alps through many villages nestled in the valleys throughout center Europe. Many have a trail up into the mountains. There is a trail network which runs throughout the higher elevations of the Alps, across national borders, over and around peaks and through meadows. Interspersed along the ridge tops and meadows are mountain huts which are fairly bare bones accommodations; but generally serve hot food and cold beer. Each is a little different, some have private rooms, some are more dormitory style. You bring the sleep sac, they provide the pillow and blanket, sort of an alpine hostel. The challenge for Americans and other non-german speakers is that most huts require reservations for rooms, otherwise you sleep in bunks with lots of others. There is very little English spoken at these huts, and the trail system is a little tricky to navigate. So having a guide is not absolutely essential, but in my mind preferred. I was first introduced to the Austrian Alps and hut system with Franz Herbert, of Bregenz. He arranged the itinerary and reservations, and has all the experience to make you immediately comfortable under varied alpine conditions. It was immediately on the top of my list of travel experiences and I went back several times with other friends, my wife and teenage kids. It’s amazing. If you like to hike, enjoy the mountains, and prefer an authentic outdoor adventure, you should experience this.